Wow. I mean seriously. Last night was absolutely amazing. The opening of my Crema show was last night, of course, and since it was my first show by myself, I didn’t really know what to expect. And it was in a coffee shop, not in an art gallery. 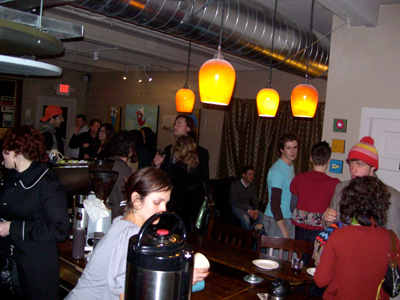 And I have long been under the mindset of “who cares about art in coffee shops, anyway?” But a lot of my art had been in there for a few weeks already, and I’d been getting a pretty good buzz about it, emails and phone calls, etc. We sent out my press release way too late, so I didn’t really get any articles or listings or anything (I think maybe online a couple places, but nothing in print that I’m aware of). And I had flyers sitting on the counter for a week or so. But mostly my advertising was word of mouth. And this blog. So yesterday afternoon when I went to Whole Foods to buy all the cheese, I told the extremely helpful cheese-man (who had an uncanny resemblance to Leo DiCaprio) that I was expecting, at the most, hopefully 50 people. 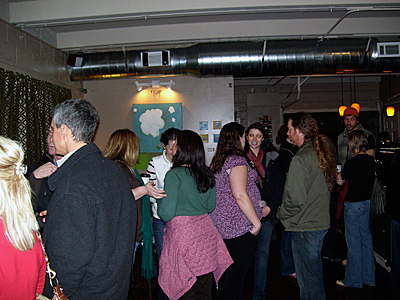 I figured, if I could actually get 50 people to go out to a coffee shop on a Friday night, just to see my stuff, that would be pretty cool! At least that would mean I wouldn’t be bored at my own opening, right? 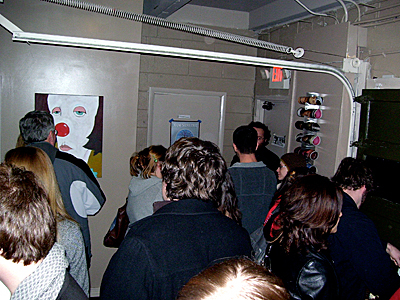 I’ve been to art openings that seemed more like a funeral, and I really didn’t want that. We’re estimating that between 150-200 people showed up! AT LEAST! It was absolutely and completely mind-blowing. Seriously, from about 7:30 – 9:30 it was wall-to-wall people. So far I’ve counted that I knew around 59 of them. I met a lot of new people. I sold 15 paintings (that’s insane). So far … I’ve actually got 4-5 commissions lined up from last night on top of the 15. And the show will be up through the end of March, so it’s not over. ** I just want to say from the bottom of my heart, how loved and supported Michelle and I feel. Thank you to everyone who came out to say Hi, it absolutely means the world to me. It’s been a crazy 4-5 months for Michelle and I, with lots of good and plenty of bad. And last night was definitely one of the great nights in recent memory. We felt lifted, we felt supported, we felt excited. Thank you so much to Rachel and Ben for letting me have my show at Crema in the first place. Thank you Chad for running out and getting more wine after I learned that with a crowd like that, six bottles only last about 90 minutes. Thank you Michelle for all your help and love and support helping me get ready for the show, even amidst being pregnant and what-not. 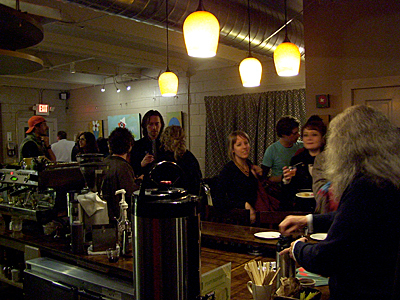 And when the opportunity to show at Crema came up, for insisting that I do it! Thank you everyone who braved the cold and were able to find the place in the dark. You truly made this a night to remember. — Being a dork and overlooking some people with the invitations … I am REALLY sorry about that. — Not taking better / more photos. Did anyone else take any that they could email me? — Not even THINKING about setting out a guest book for people to sign. I could kick myself for that. But I have absolutely no complaints. It was wonderful. Sorry if I am gushing, I am just very happy. Now I have a baby shower to go to and then a newborn to go see. It’s a baby day, for sure. P.S. I am also giddy with excitement to know that our son was able to attend my first ever solo show, via his mommy’s belly :) You know, the baby can hear stuff, right? Last night there were lots of great vibes. I’m sure baby was happy.